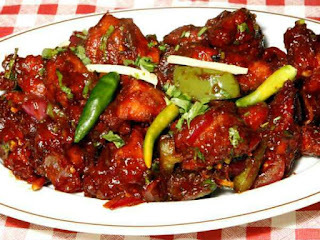 Chilli Chicken - A very popular indo-chinese dish. Chinese chilli chicken is made of boneless chicken pieces deep fried and served in chinese gravy. Chili chicken is a hot and spicy Indo-Chinese chicken recipe. It is mostly ordered Chinese dishes Indian restaurant. Chicken deep fried in a tantalizing batter and coated with nice hot and spicy sauce. How To Make chinese chilli chicken. 1.Cut the boneless chicken pieces into1 " cubes. 2.Take 1tbsp. Soya sauce, 1tbsp. corn flour, salt, egg in a bowl and marinate chicken pieces in the the mixture for about 10-15 minutes. 3.Heat oil and deep fry the marinated chicken pieces till golden brown. 4.Now in a separate wok / kadhai heat 1 tbsp. oil and add garlic paste and green chilies andsauté for few seconds. 5.Add 2 cups of chicken broth or water. 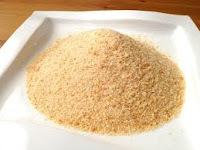 Bring to boil and add sugar, pepper powder, salt , ajinomoto and remaining Soya sauce. 6.Add fried chicken pieces to it and cook for few minutes. 7.Dissolve the remaining corn flour in 1/2 cup water and add to the gravy stirring constantlyto avoid lumps. 9.Serve chinese chili chicken hot garnished with chopped green onion tops. 10.Chinese chili chicken goes well with steamed/ boiled rice. 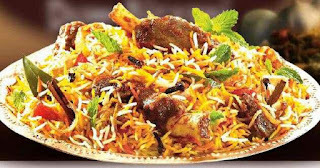 Mutton Biryani is a delicious Indian recipe popular in Hyderabad. This recipe is made with mutton but can be substituted with chicken or fish. For die hard mutton lovers India is a heaven. India can boast for its innumerable varieties of tasty and delectable mutton dishes. 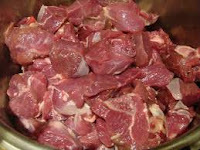 1.Wash mutton and take it in a vessel. 2.Grind green chillies, ginger, garlic, spices, fried onion, and mix them all, then add this mixture tothe meat. 3.Then add curd to it, mix the stuff thoroughly. Leave the material for half an hour. 4.Take 2 litres of water in a vessel and put it on the stove. 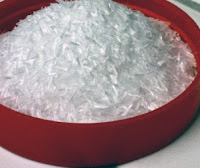 5.When water boils well put the rice in the vessel. Take out the semi-cooked rice and spread it on the meat and spices mixture as a layer. Take some more rice and spread as second layer. Finally, spread the fully cooked rice. 6.Prepare a mixture of one cup of boiled water and 1/4 kg ghee and spill it on the rice. 7.Now put a plate on the vessel and seal the edges with dough. Put the vessel on the stove, cook for 15 minutes on medium flame. 8.Then turn off the stove. Leave the stuff for 15 minutes. 9.Hyderabadi mutton biryani is ready to serve. 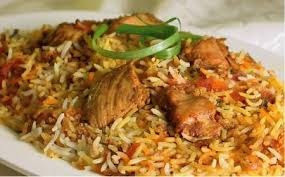 Chicken Pulao or Pilaf is an Indian dish believed to be an Persian influence dish brought to India by the Mughals and has become well known and very famous dish all over India / Pakistan. It is made from chicken and rice and is served on all special occasions. Pilaf or pulao, as it is known in the South Asia, is a rice dish popular in India / Pakistan. Marinate the chicken in a mixture of the yogurt, ginger & garlic paste and salt and leave it in the fridge for about one hour. Heat oil in a heavy and large pot add onions, cumin seeds, cloves, cinnamon sticks cook for about 3 minutes on medium flame, add red chili powder, turmeric powder and cook for another few minutes on low flame, add green chilies and tomatoes cook for few minutes on low flame, add marinated chicken and some water cook for about 30 to 40 minutes till chicken is cooked best way to check if chicken is cooked in by piercing a skewer through the chicken and if skewer comes out dry it means chicken is cooked. Now spoon about 2 tablespoons of fat/oil from the cooked chicken mixture into another pot. Add 2 cups of the rice and salt to taste. Stir until the oil is coated around the grains of rice. Add half the chopped coriander leaves and one cup of gravy from the chicken mixture and two cups of hot water. Cook on slow heat with the lid on until the rice is cooked. Add a little hot water if the rice is not yet cooked. To serve, place the rice in a large tray or platter. Spoon the chicken mixture on top. Sprinkle with the remaining coriander leaves, Fried nuts (cashew or almonds) and sultanas may be added. Our most popular recipe ever! 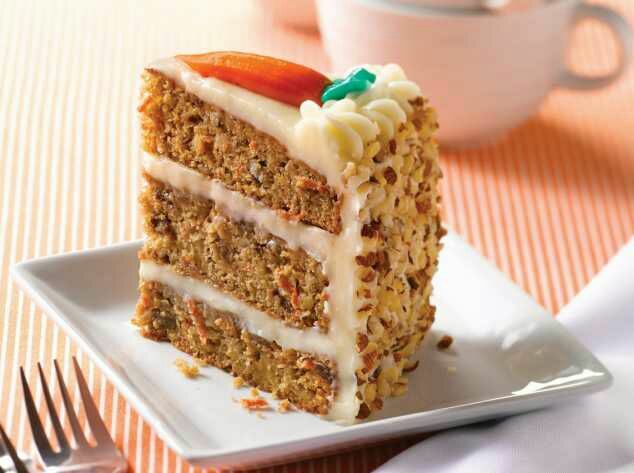 This moist carrot cake is welcome at birthdays, weddings, reunions and all special occasions..
1.Preheat the oven to 150 degrees C.
2.In a pan mix nicely the all purpose flour, mixed spices, baking soda, brown sugar, desiccated coconut and chopped walnuts. 3. In a separate pan melt the butter and add the golden raisins, carrots and orange juice. Stir it nicely and pour it on top of the dry ingredients. 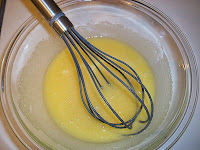 4.Now add the beaten eggs to the mixture and mix it thoroughly. 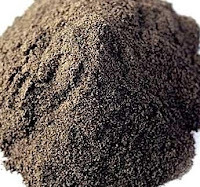 5.Prepare a loaf tin by oiling the base and the sides, pour this prepared mixture into the tin and bake the cake for 50-60 minutes or until a toothpick inserted into the centre of it comes out clean. 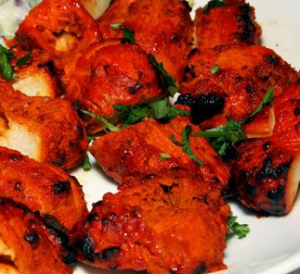 The word tikka means bites or pieces, chicken tikka is a popular Punjabi dish made of chicken cutlets in a marinade. 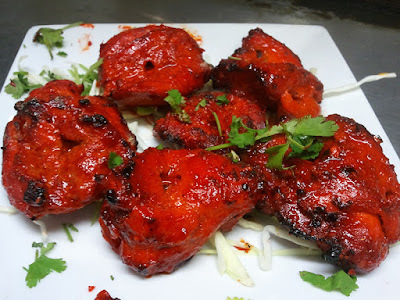 Chicken tikka is traditionally small pieces of boneless chicken baked using skewers in a clay oven called a tandoor after marinating in spices and yogurt, essentially a boneless version of tandoori chicken. 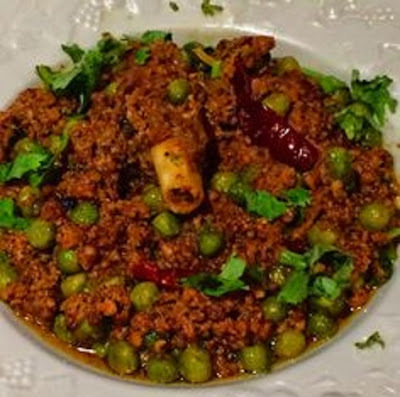 It is said to be more famous in Pakistan then India because meat plays a much more dominant role in Pakistani cuisine, compared to other South Asian cuisines. According to a 2003 report, an average Pakistani consumed three times more meat than an average Indian. 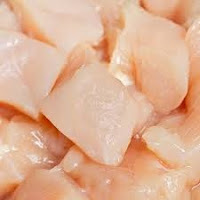 Cut chicken into about one inch pieces and wash it well. In a bowl add salt, ginger garlic and paste, tandoori powder, yogurt and lemon mix everything, add chicken and marinate it well. cover it and put it in the fridge for at least four hours. There are few different ways to cook, you can fry in the oil, but we are going to share with you how to make them in the oven. Preheat the oven add the oil on the chicken and put it in the oven, roughly takes about 25 to 30 minutes but please keep checking it till the tikka is ready. Please leave your Comments if you like my hard work. Mutton is one of the most most eaten meat in the world. Mutton curry is a well known dish around the world and made so many different ways with so many different vegetables. Mutton curry originated in South Asia and has become very popular in Indo-Caribbean cuisine. 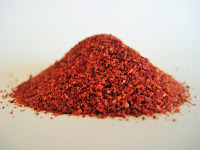 This dish has spread throughout the English speaking Caribbean and also the Caribbean diaspora in North America and Great Britain. 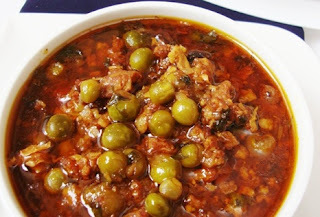 It is very simple to make and the taste is so yummy you will want it again and again. Heat the oil in a pan, add onions and cook till onions are brown, add red chili powder cook well on low flame, add salt, tomatoes, ginger garlic paste, green chilies, turmeric powder and yogurt cook well for about 2 minutes, add green peas and half cup water cook till water evaporates add boiled mutton and garam masala and mix well, cook for another few minutes on a low to medium flame. serve with Chappaties, naans or boiled rice. 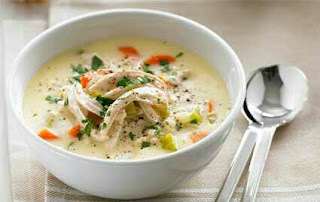 This is a super easy recipe for making your own home made cream of chicken soup. as most of you know I love chicken. 2.Pour in the semolina slowly, stirring until mixture comes to the boil. 3.Add mustard, salt and pepper. 5.Beat 1/4 pint of the soup into the egg yolks, mix well, and whisk mixture into the soup. 6.Add top of milk or evaporated milk, mix well but do not allow to boil again. 7.Pour into flour heated soup bowls. 8.Sprinkle crisp bacon garnish on tops. Remove rinds and brown edges from 4 rashers of streaky bacon. With scissors cut bacon into 1/4" strips, put in a shallow tin under heated grill until brown and crisp. Put on to kitchen paper to absorb fat, then sprinkle over the soup. 2.Note:Chicken Carcass left from roast or boiled chicken can be added to the soup, add all scrapes of meat removed from bones and returned to the soup after cooking; also use any chicken giblets. you to cook a great meal for family or friends. Indian fish curry recipe from today. This is the favorite fish curry dish from the eastern part of India. I have to practice it 3-4 times to achieve perfection. Try this curry with plain steamed rice--you'll love it. 1.Marinate the fish in salt and turmeric powder for 15 minutes. 2.Shallow fry the fish pieces, drain and keep aside. 3.Grind the coriander leaves, garlic and green chillies. 4.Heat oil, add masala paste and fry till the oil separates out. 5.Add tomatoes, methi seeds and powder masalas and fry till the oil begins to float on top. 6.Add about 1 cup water. Bring the gravy to a boil. 7.Add the fish slices and cook for 10 minutes. Hope you enjoyed your Xmas and had lots of turkey. This year we tried something different with our turkey and believe me it was the best turkey we have ever had. Because the meat is so dry we never fined our turkey for last God know how many year. So this year we thought lets change the way we have been making it, we bought 8kg turkey for £38.00 from local shop and what we did was split it in 2 halves, we roasted one half yesterday and making one half today. Yesterday it was steam roasted bites with Indian spices. It was so yummy and juicy it was gone within 20 minutes. Everyone loved it and they wanted more, hope you will like it as well. add turkey meat and marinate the meat with your hands (washed), once its well marinated cover it and put it in the fridge for at least six hours so all the flavors go deep into the meat. 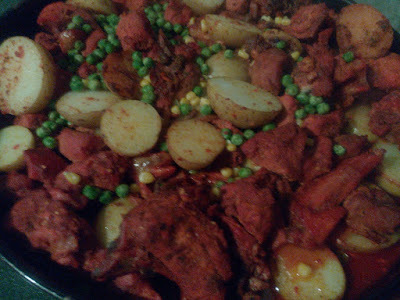 add potatoes, green peas, sweetcorn and cover it with the lid and cook for another 20 minutes. Preheat the oven put everything from the pan into a baking tray, spread it well and put onion slices, lemon slices on top cook till you think its best finish for you. Enjoy your roasted turkey bites. Please do not forget to subscribe and do leave your opinions. The Kashmiri Style Dum Aloo Recipe is a rich healthy and delicious dish made from potatoes. 2 : Daalchini (cinnamon sticks) chutney. Grind together, the bari elaichi, laung and daalchini. Put aside until further use. Boil potatoes until half cooked. Peel while still warm. Pierce each potato 2-3 time with thin wooden toothpick. Heat oil in a kadhai, fry potatoes on medium heat until floating on top and golden brown in color. Drain excess oil and keep aside. To the dahi, add salt, besan and 1 cup water. Whisk well, until smooth and lump-free. Reheat 4tbsp of the same oil in another pan. Add red chillies and chhoti elaichi and fry for a minute. 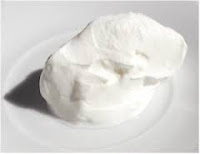 Remove from flame, allow to cool slightly and then pour into the dahi, stirred continuously. Return to flame and bring to a boil, again stirring continuously. 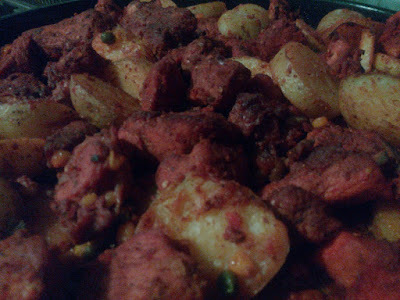 Add potatoes along with soonth, saunf and ground masala. Cook over medium heat for 5-10 minutes or until the curry thickens. Serve hot accompanied by Boiled rice. Enjoy The Recipe. 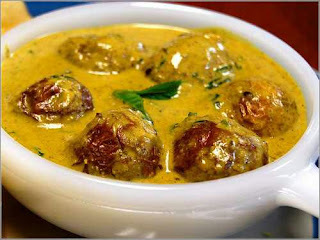 Meatballs is one of the biggest dish around the world and every nation has its own way to cook this dish, but meatballs originally were invented by Chinese and it still it one of the main cuisine in eastern part of China. 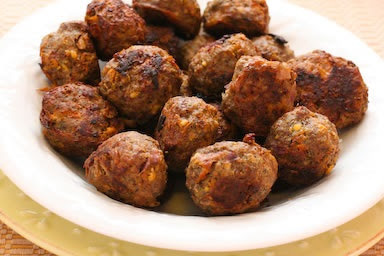 The history of meatballs is dated back to Qin Dynasty (221 BC to 207 BC). 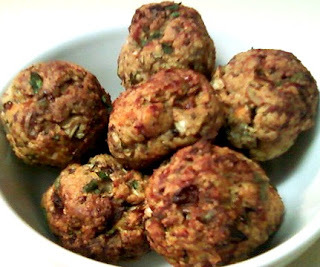 Ancient Roman cookbook Apicius included many meatball-type recipes as well. The original Dragon head is made of pig meat and vegetables, but as found in earliest Arabic known cookbooks from pig meat to other meats which Muslims could eat as well as non Muslims. Today we are going to share Chinese meatballs with Indian and Pakistani touch but we will try our best to keep it as close to Chinese recipe as possible and will not add too much of Indian or Pakistani flavour. Hope you will enjoy it. 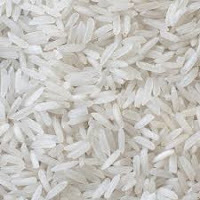 In a pan add water and rice to boil them and rinse them once you know the rice are about 95% boiled. Add black pepper, salt, soya sauce, Chinese salt, corn flour and boiled rice mix everything really well by using your hands (washed), make the small size balls. Heat the oil, dip the balls in stirred egg and put bread crumbs all over the balls, put the balls in well heated oil and cook on low flame till brown from all sides.